SUMMARY: Went to Rachel's for contact work. Long drive, interesting touristing. I set up an appointment with Rachel a couple of months in advanced, she's so booked up. Last Wednesday was the day. I groggily rose and was on the road with the beasts by 8:30 for our 11:30 appointment in Atascadero. Tuesday was a beautiful sunny day. Thursday was a beautiful sunny day. Here is what it did on Wednesday, at least within a 10 mile radius centered on Atascadero. So we stood bravely in the drizzle for the better part of 3 hours to talk about contacts and how to use her box-training method to help Tika's dogwalk up and start her on a running Aframe. 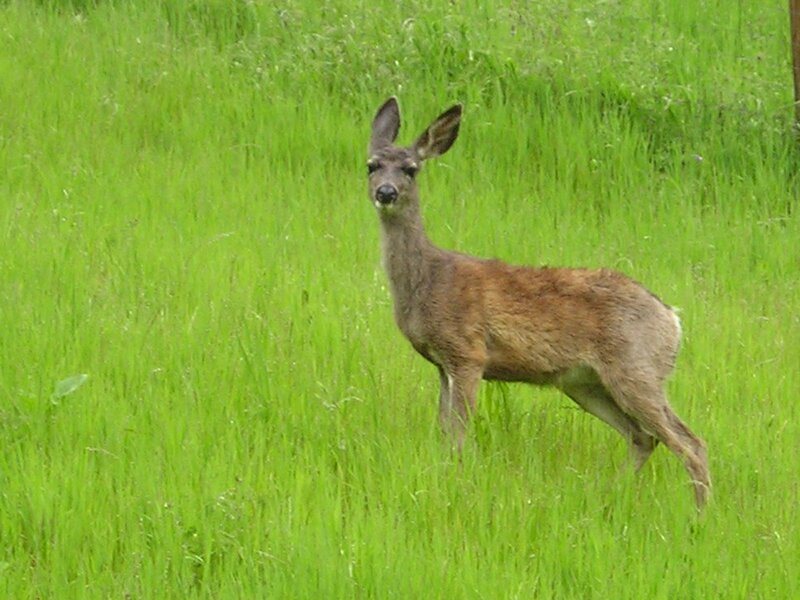 Here is what the view from Rachel's yard looks like. Rough life, huh? (Rachel suggests that the problem with "Hit it!" is that it makes the judges look more closely at the up contact because now they know that you have an issue with it.) But at the end of the session, we tried to get Tika to miss the dogwalk up to see whether we could detect a pattern, and she nailed it every time, over and over. And we were both running full out, too. So she's not missing when she's trying to catch up to me. Or maybe it was because we'd spent an hour and a half getting her to get her two feet into the box on the ground so she was more conscious of it. (We weren't using it on the dogwalk.) Rachel thought that Tika was, in fact, already adjusting her stride when I said "hit it!" on the dogwalk, even though we've never used the box on the actual equipment. Huh. Maybe. We also worked on Tika's boxwork for the Aframe down contact as described in Rachel's seminar. So, anyway, I have homework to do on getting her to do the boxes correctly at a full run (when she speeds up, she starts dropping just one foot in for the dogwalk box and only a couple of feet, not 4, in the Aframe box). I said that I wanted to tweak Boost's down contacts a bit because, although she's fast, she takes about 300 fast, tiny steps in the last part of the descent, and I thought she'd be faster if we could eliminate those. Rachel watched her do a couple. Boost did a couple of absolutely perfect Aframes, no slower steps, and Rachel said, you've got a genuine 2-second dogwalk, and there aren't many people who can really claim that. Why mess with it? So I guess I won't. So we did a little work on how I cause refusals with my handling of Boost. Here is what I look like after several hours of rain and with knowledge hopefully soaking into my brain along with Atascadero water-fall-from-sky and a 3-hour drive home ahead of me. I've been doing these Wednesday evening hikes starting at 6:00 to help me get ready for Havasu Falls. But, leaving from Atascadero around 3, there was no way I'd make a 3-or-more-hour trip plus drop off the dogs and change my clothes. So I suddenly realized that I had something I almost never have: A leisurely drive home with no deadline, where I could stop or do whatever I wanted. And since it wasn't a hot, sunny day, I could even leave the dogs in the van. 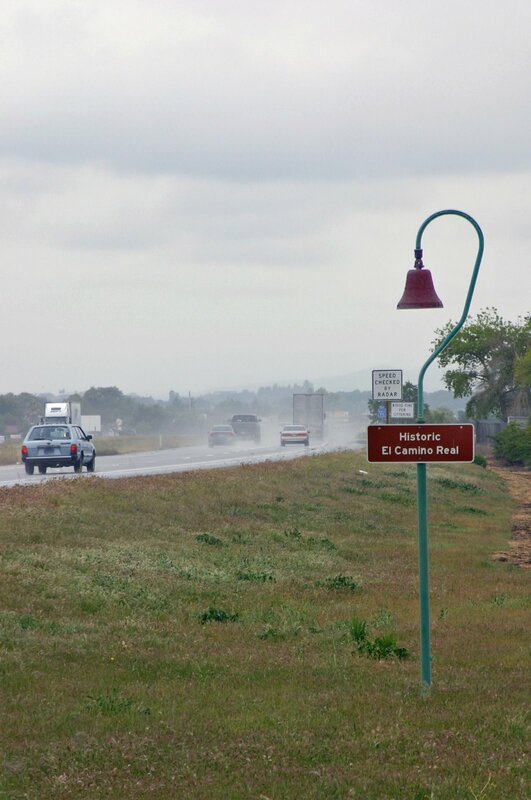 I'm glad that they're back, lining El Camino Real all up and down California. They used to be there, then idiots gradually stole them all, and now I guess they've found a way to attach the bells so that they aren't so easily removed. The mission itself is somewhat open for tours, although the church and cemetery are current closed to the public because the walls are about to fall on top of you and are propped up with giant props while they retrofit it to better withstand earthquakes. The arches on the extension next to the church are all of different sizes and shapes. They claim that this was done deliberately and that San Miguel was known far and wide for these interesting arches. Personally I suspect that the architect was known far and wide for having too many sangrias. When I looked in Wikipedia for a link to the mission, I discovered that the article was sparse and had no modern photos, so I had to add some photos and more text. 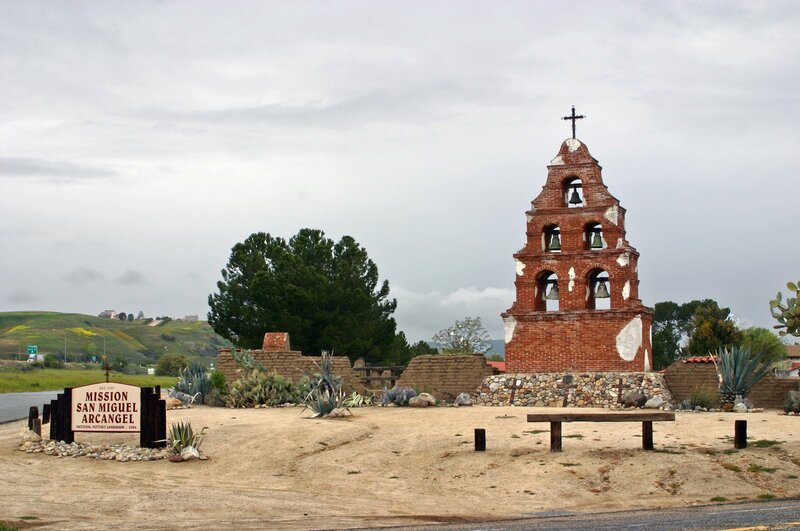 View the updated wikipedia article on Mission San Miguel Arcangel. Across the street, I discovered that there's an old adobe that's also an historical monument, the Rios-Caledonia adobe. It originally served as a stage stop and inn on old El The Camino ancient historic Real until the train put a stop to that (perhaps the very Santa Fe rotting down the road a bit? ), then it was used for an assortment of purposes until someone got the great idea of turning it into a tourist attraction back in the 1930s when it was still practically new (well, compared to now, anyway). When I went to wikipedia for a link to THAT article, I discovered that there WAS no article, just links to it in various places, so I had to write it up and upload more photos, which you can see here. The mission and adobe are tied together somehow in a weird mass murder, if you're into that sort of history. 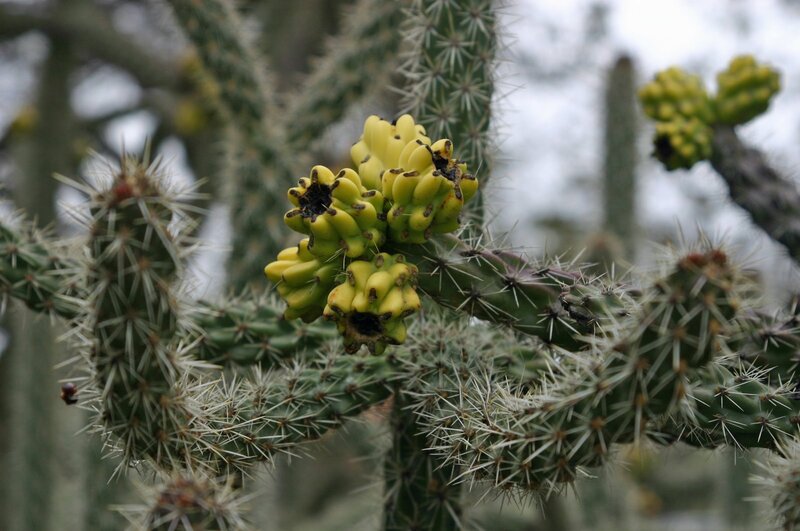 The adobe museum is open only Friday through Sunday, but the grounds were open, so I could browse the outside, admire the fact that they had doggie-pick-up bags readily available onsite, and get both eyes poked out simultaneously in the well-tended cactus garden. On the trip, I passed The Old El Camp Roberts, which looks like it's falling apart, literally, although it's supposedly still in use by the National Guard. I must have missed an earlier post about how you are training Tika's ups. I'm trying to figure out how to teach big dogs to get them reliably. What's the deal with the box? Teach her to find it and eventually stick it on the up contact? I guess I'll have to post a few details about what the goal is. I'll try to do that this week if I have time before departing for Haute TRACS. so much for the contact work..
i hope the kids will nail it soon.. I did get quite a bit out of the session. As always, it's now up to me to do something about the info I have, and that's always the weak link in the chain. But I certainly enjoyed the touristing on the way home. What happened with the semi? Would you believe... it crashed into me head-on and we both died? Um. Maybe not. Fortunately, nothing happened--it was being towed behind another semi. My gut instinct was to scream in terror, even 'though I could tell that it was moving in the same direction I was moving and therefore MUST be in tow. My brain had a hard time with that, though, because you couldn't see the towing vehicle until you were nearly next to it. I'm glad you didn't hit it! :) I couldn't figure out from the picture what it was doing in your lane heading toward you! I'm enjoying your blog. I have a 15 mos old sheltie that is going (back) to obedience school in May when I graduate from people school, and then hopefully we will begin to try agility. I think she'll love it. Thanks! When I started agility with my first dog, I had to do some remedial obedience training, as it all went to pot off-leash in an exciting environment. We did well, though; he eventually earned an agility championship. Your sheltie probably will love it; most dogs seem to. 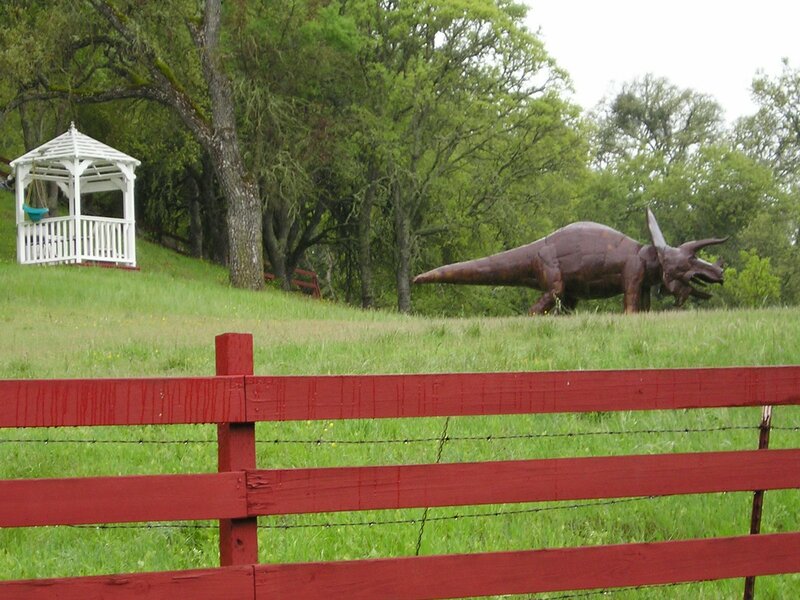 The triceratops leaving its native gazebo was hysterically funny. I somehow missed it the first time I read your blog, but Sarah pointed it out to me. First the deer, then the dinosaur. HILARIOUS! And now we're going to watch Short Circuit. I've never seen it, but Sarah says it's awesome.